On land penguins look very clumsy. They waddle as if they were drunk or slide on their tummy over the ice. Especially those young birds, who come ashore after 18 months on sea, look as if they have to learn to walk again. Some even remain lying down, pretending to sleep after so many falls, to avoid the painful situation. 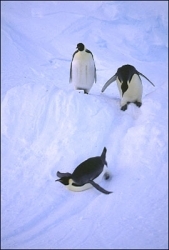 Research showed that waddling is the most effective way for locomotion on land, while the save more energy by waddling as when they would walk upright. And if you consider the distance of about hundred kilometres an emperor has to walk before reaching the colony, this, of course is very important. 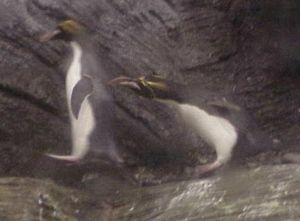 Rockhoppers (crested penguins) jump from rock to rock, like their name already says. They hop, climb and scramble over precipitous rocks, using their claws, bills and flippers. Preening too is very hard (see Body-care). To reach the preen gland, located on the back near the base of the tail, they have to bow backwards with wide-stretched necks. Here too they often have little accidents. And for scratching their chin, they have to balance on one feet, which isn't easy either. Most of the time they walk with a speed of about 1 or 2 km per hour, but in danger a frightened penguin can run a lot faster than a human being over snowy rocks and ice.